Sherwood Park Apartments prides itself on the very highest standards of service and hospitality on an island noted for friendliness and good service. Our manager, Nigel, will personally brief you on arrival with practical tips about Sherwood Park and the island of Tobago. Nigel and his capable, friendly staff will do everything possible to make your stay unforgettable. We want you to leave as friends, not just patrons. 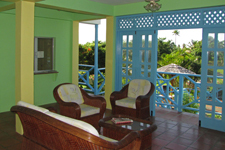 The beautiful views from your balcony; the sounds of nature and quiet nights; the pleasant tropical climate all year round. Sherwood Park offers the perfect environment, so closely matching the very nature of Tobago itself: small, unspoilt and so very beautiful. Nigel and his staff will be delighted to recommend and help you to arrange every aspect of your Tobago holiday itinerary. Sherwood Park Apartments - Friendly, Helpful, Welcoming!